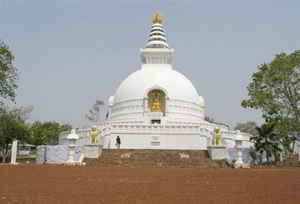 A beautiful city positioned in the Nalanda District in the state of Bihar, Rajgir entices the attention of the tourists from all over the globe. The place is enveloped by rocky hillocks and is placed in a valley. Moreover, the serene ambience of this place will refresh your mind and soul. It is the destination where Gautam Buddha is believed to have given many sermons and Lord Mahavir had lived here for some time. One can also explore Buddhist monks meditating at a site known as Vultures Peak. The knowledge of Buddha was written in this place and it also serves as the place for the first Buddhist Council. It is also a home to various Hindu and Jain temples. Not only this, it has water ponds which are deemed to have medicinal properties helping in the treatment of scores of skin diseases. It has an appealing history to reveal to its visitors. Legend has it that Gautam Buddha frequently paid a visit to this place at the Jivankamaravana Monastery in a tranquil setting. And it was here at the Gridhakuta hill; Lord Buddha converted one of the pilgrims to Buddhism. In very old time it was called by many names such as Rajgriha, Barad Rathapura, Girivraja and Vasumati. The place is linked with the son of Brahma, Vasu who is said have created the ancient Girivraja. Moreover, it is connected with Brihadratha and Jarasandha. Vishwa Shanti Stupa: Constructed by the Japanese atop the Ratnagiri hill at an elevation of 400 m above sea level, Vishwa Shanti Stupa is a main attraction of Rajgir. It is flocked by many a tourist from different parts of the world. Griddhakuta: It was the much loved site of Gautam Buddha where he gave many lessons after attaining enlightenment. To reach the top of Ratnagiri hill, you have to take a ropeway and within minutes you will be there. 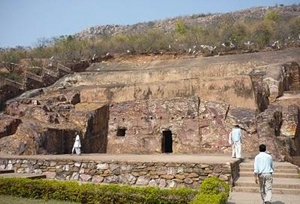 Pippala Cave: Positioned above hot springs on the Vaibhava Hill in proximity to Rajgir, Pippala Cave is deemed to have been a site of holiness during the period of Gautam Buddha. Karanda Tank: It is the destination where Gautam Buddha would take a bath during his holiday in Rajgir. There are leftovers of this tank reflecting the magnificent past of the Mauryas and structural exquisiteness. By Air: The closest airport to make it to Rajgir is situated at Patna, about 58 miles away. By Rail:	It is well connected to the main cities of India by rail. One can also hire a taxi from the railhead to reach the desired destination.